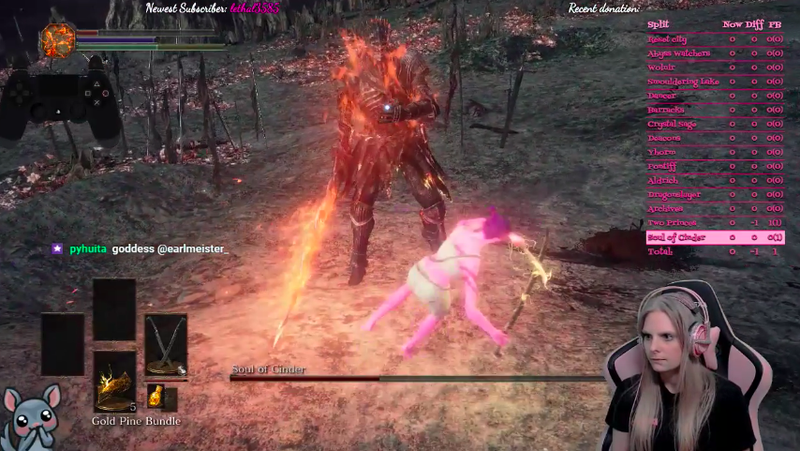 1,200 hours, eight months, and innumerable vape hits after Dark Souls III streamer Suzie first attempted a no-hit run of the infamously difficult game, she lit her final bonfire last week. Suzie says she’s the first woman to record herself playing through Dark Souls III without getting hit. She pulled off the feat to demonstrate that women shouldn’t be afraid to try for over-the-top accomplishments in games. It’s difficult to prove that Suzie, 28, is in fact the first woman to do a no-hit run of Dark Souls III. In our research, Kotaku hasn’t been able to find another. Regardless of if she’s actually the first, any no-hit run of the brutally hard game is impressive, something that only the top tier of players can aspire to. Suzie, who lives in Norway, has slowly and assiduously become phenomenal at Dark Souls III while attempting to complete the game without getting hit by an enemy, a quest she’s been on since October 2017. Over time, more viewers turned into her stream. Sometimes, she said, they’d try to backseat-drive her run, which she attributed to her gender. She’s gotten good at shutting them down. “I guess it’s just a norm, which I think is kind of sad, but also kind of inspires you to change it,” she said. Her successful three and a half-hour run is full of clean fights, deft dodging, and lots of workarounds. Sometimes, she’ll take fall damage to boost her damage output, a buff from an item she carries.